Here are some questions that we often get from our clients. Why should I use All Purpose Steamers instead of other companies? We provide a service, which is unmatched among our competitors. Since we are a family owned and operated company, not only do we cater to every customer needs but fully educate you on what you should expect from us and what to expect from other services for cleaning your carpets. Imagine it's your day off, your day is planned out and you needed to get you carpets properly cleaned. We come in and steam-clean some rooms for you. We're done within 30 to 45 mins then you went about your day. You come home later on that day, your carpets are 100% dry and they look brighter in color than they did before you left. That is because we informed you that our truck mounts' powerful extraction only leaves your carpets damp to the touch(which is why they appear a bit darker due to the moisture), never wet and they dry within 4 to 6 hours. This is why our goal is the complete satisfaction of our customers. Plus we are an A++ rated company in the Better Business Bureau and A+ reviews on Angielist to name a few. Why is steam cleaning better than other methods? Steam cleaning provides a healthy, non-toxic way of cleaning carpets and upholstery. In this cleaning process, hot water is turned into steam and combined with non- chemical based GREEN detergents to break down dirt and tough stains. This leaves no soapy residue and thoroughly washes your carpet and upholstery. Why is a truck mount necessary? 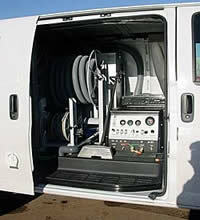 A truck mounted unit allows the cleaning system to run off the V-8 engine of the truck. Maximum power and efficiency in your home. No sloppy portable units, the dirt and stains come with us when we leave your house. How come this method costs more than other methods? It's not that our method costs more money. Most companies do their best to just get in your house. They proceed to charge for soap, furniture moving, pre-spotting, brighteners etc. All Purpose Steamers does what it can to thoroughly clean your carpet and upholstery for the price given. What is Scotchgard™ and why do I need it? Scotchgard™ is a protectant for carpets and upholstery. Scotchgard™ works like a wax coating on a car and prevents further damage to your carpets and upholstery. The protectant is sprayed evenly over the entire carpet surface and worked deep into the fibers using a carpet rake. It allows the consumer to clean future spots with ease and prevents fabric breakdown. Will your deodorizer-sanitizer take care of the smell from my animals (urine, vomit, body oils) ? In most cases yes, in some cases no! Cat urine and dog urine is very potent and can penetrates through the carpet and into the padding or wood floor. Although the carpet will be clean and completely sanitary, there are some cases where the odor remains. What do you do for water or flood damage? Every flood is different. In most cases the carpet is cleaned and dried, sprayed with deodorizer, sanitizer and mildew treatments. In other cases the carpet is pulled back, the padding is ripped up, the floor is dried and treated. The carpet is then thoroughly cleaned on both sides, treated and dried through the use of industrial strength blowers and dehumidifiers. Can we trust All Purpose Steamers in our home? In our eight years experience, we have had many customers leave us in their homes to clean or leave us with keys and a blank check or credit card number! Although we do not recommend this for you, it does happen quite frequently. Our ideal situation is for you to watch how we work and see for yourself what a great job we do. Do we use recycled dirty water? We NEVER recycle dirty water! Fresh water is used to clean your carpet 100% of the time. Our trucks have a fresh water tank and a completely separate waste tank. Both tanks have a 100 gallon capacity to handle both large and small cleaning projects.